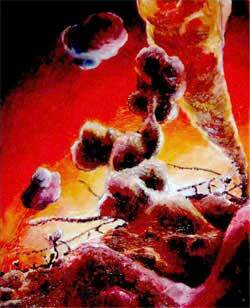 (Nanowerk News) Scientists from the Max Planck Institute for Molecular Cell Biology and Genetics (MPI-CBG) in Dresden, along with a colleague from the University of Florida in the United States, have been carrying out research into how transport proteins can move in cells without bumping into or sticking to anything. Using an ultra-sensitive microscopy method, the researchers have defined how the motor protein Kinesin-1 interacts with its "transport rails", the microtubules, based on a nanometer scale. The motor protein stays at a distance of 17 nanometers from the microtubules, which explains how it manages to carry its load to its destination without collisions ("The distance that kinesin-1 holds its cargo from the microtubule surface measured by fluorescence interference contrast microscopy" - open access article). Cells are very similar to the Port of Hamburg: goods and commodities arrive, have to be classified, temporarily stored and subsequently dispatched. In both small and large cells, it is very important to avoid backups and collisions, as these transport processes are vital for every organism. Motor proteins take care of transport in cells, carrying their goods back and forth like small containers. They need transport rails to accomplish this, otherwise they would float aimlessly in the cytoplasm. This role is performed by microtubules, among others, long thread-shaped structures about 25 nanometers in diameter and several micrometers in length, which extend through the whole of the cell. Motor proteins, of which kinesin-1 is a well-researched example, consist of a head, middle section and tail. They are considerably smaller than their transport rails. Whether kinesin-1 is transporting individual cell organelles or other cargo, its head section moves forward step by step on a microtubule - the length of the step and the precise coordination of such steps have already been investigated in detail. It is also known how kinesin attaches the load to its tail. But how do the small motor proteins make sure that nothing gets caught up during transport? The crucial question is: how many nanometers from the microtubule does kinesin-1 hold the load during transport? Does this perhaps have anything to do with the previously unexplained role of the section between head and tail? Naturally, it is not possible to simply measure nanometers with a ruler. For the scientists working at the MPI-CBG in Dresden, Jacob Kerssemakers from Stefan Diez’s Junior Research Group and Jonathon Howard (MPI-CBG) and Henry Hess (University of Florida, USA), analyzing a process in such a minute dimension presented a major challenge, both technically and in terms of methodology. They accomplished this feat using a highly sensitive, indirect microscopy method, in which the researchers caused molecules to which they had previously administered a fluorescent dye to glide over a reflective silicon mirror. Depending on their distance from the surface, the molecules lit up to different degrees as a result of the interference effect (Fluorescence Interference Contrast: FLIC). Consequently, the distance is indirectly determined by the level of brilliance. As large microtubule filaments are easier to perceive using this method than individual kinesin-1 molecules, the researchers injected them with the dye. "The whole system had to be turned upside down," explained Kerssemakers. Therefore the researchers did not directly measure the distance of the motor protein from the microtubule, but the distance that kinesin-1 holds the transport rails from the reflecting surface. To this end, they covered the reflective surface of the FLIC microscope with the motor proteins, to form a "kinesin lawn" so to speak. The "kinesin stalks" held the microtubules away, at precisely the distance at which the load otherwise glides along the rails. After precisely calibrating the measuring system, the scientists finally calculated the distance. The result is 17 nanometers; the distance at which kinesin-1 keeps the microtubules or holds its cargo from the microtubules. This value is most expedient, as the majority of particles that become obstacles in cells are smaller than this gap. It would appear that this is how refined motor proteins succeed in getting cargo to its destination without any resistance or catching. Consequently, this finding quite literally sheds a light into another aspect of the dark intracellular transport channels.